Ghastly Menace: There weren’t many people in the Uptown Theater shortly after 6 p.m., but Ghastly Menace played with an intensity like they were trying to convert everyone in the room. Pushed to the lip of the stage by everyone else’s equipment, the six-piece band from Chicago had no problem generating multi-layered indie pop that had the small cluster of fans dancing throughout the 30-minute set. Hembree: It didn’t feel like Friday night until “Walk Alone.” The third song in Hembree’s half-hour set at the Uptown opened with a loping guitar eventually joined with a four-to-the-floor drum line that nailed everything into place. The rest of the set didn’t match that moment, but blending synth-pop with shades of Americana and folk harmonies created an interesting sound definitely worth further exploration. Shiner: Positioned between three indie-centric bands, Shiner hit the reset button at the Uptown with a 40-minute slab of hard rock. One of Kansas City’s best ’90s bands, Shiner hasn’t played many shows since breaking up in 2003. Singer/guitarist Allen Epley was a bit rusty, begging fans to forgive him if he flubbed the lyrics. After one number he told the crowd the band played it just to prove they still could. He needn’t have worried. The dedicated fans that filled a healthy portion of the floor were just happy to soak up every note they could, knowing it would likely be a while until this next chance. 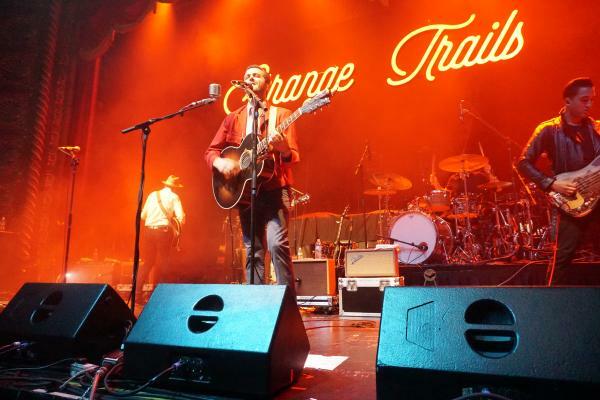 Lord Huron: Near the start of Lord Huron’s one-hour set, frontman Ben Schneider recalled the last time the band played town they were at the Riot Room. Those days are long over. Overcrowding on the floor at the Uptown forced the balcony open. If Coldplay went camping they’d land pretty close to Huron’s earthy, indie folk. Schneider’s warm vocals and jaunty arrangements managed to make lyrics like “darkness got a hold on me” sound sunny. Highlights included the spaghetti Western-influenced “The World Ender” and “Fool for Love,” a new song driven by the Bo Diddley beat. Atmosphere: In the hands of anyone else, getting a crowd to shout “I’m happy to be alive” and commanding them to wear a smile would be corny. Not so for Slug, MC for the Minneapolis hip-hop group Atmosphere. Witty wordplay and upbeat samples made the show more party than preachy. Fans at the Uptown eagerly rhymed along and bounced up and down with each song. For 70 minutes, he told stories to a packed floor about fighting temptation (”Lucy Ford”), celebrating circumstances (”Kanye West”) and self-worth (”God Loves Ugly”). Bass Drum of Death: While not particularly lethal, Bass Drum of Death are very much what-you-see-is-what-you-get. With just two guitars and drums, the sound is so stripped down that even backing vocals are considered a luxury. 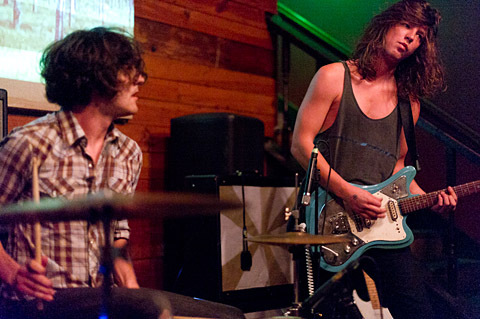 The three-piece band from Oxford, Miss., traffics in the same garage and classic rock as Jeff the Brotherhood: sharp bursts of scuzz that pack plenty of punch and don’t overstay their welcome. The post-midnight crowd at Ernie Biggs enjoyed what it got. A low stage meant bad sight lines, but dozens of heads clustered around the band bobbed and throbbed with the beat throughout the 50-minute performance. Katy Guillen and the Girls: They closed down the Westport Saloon. Their 1 a.m. set drew a substantial amount of fans, who sang along and rejoiced in Guillen’s every guitar solo. Rooted in the same blues rock as Cream, Guillen and her tight two-piece rhythm section shined especially bright when they stretched out on long instrumental passages.